Flex Clips - Please contact us directly on 0161 336 5065 for bespoke products not listed as we specialise in made-to-measure vents and custom designs. 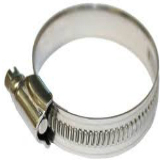 9mm continuously threaded stainless steel band. Flex Clip for connecting flexible ducting to fan spigot & other equipment. 110mm maximum spigot diameter. Flex Clip for connecting flexible ducting to fan spigot & other equipment. 165mm maximum spigot diameter. Flex Clip for connecting flexible ducting to fan spigot & other equipment. 265mm maximum spigot diameter. Flex Clip for connecting flexible ducting to fan spigot & other equipment. 325mm maximum spigot diameter. Flex Clip for connecting flexible ducting to fan spigot & other equipment. 525mm maximum spigot diameter.